A random number generator selected comment number 11 as the winning comment. Congratulations Terri. I will contact you to arrange delivery of the items. Enjoy! In honor of the start to the shopping, err I mean holiday season, Apples and Butter is hosting a giveaway of yummy treats and a cookbook filled with lots of tempting, delicious recipes. I don't know about you, but one way I manage to get everyone checked off my list is by baking their presents. It is more affordable than purchasing gifts for everyone on my list and it has the added bonus of putting me in the holiday spirit. Last year I undertook the major project of truffle making. The truffles were delicious and I hope enjoyed by all recipients, but I will not be repeating that process in my tiny New York kitchen. This year cookies are on the gift-giving menu and I have every intention of finding some of those recipes in the cookbook from Tate's Bake Shop. 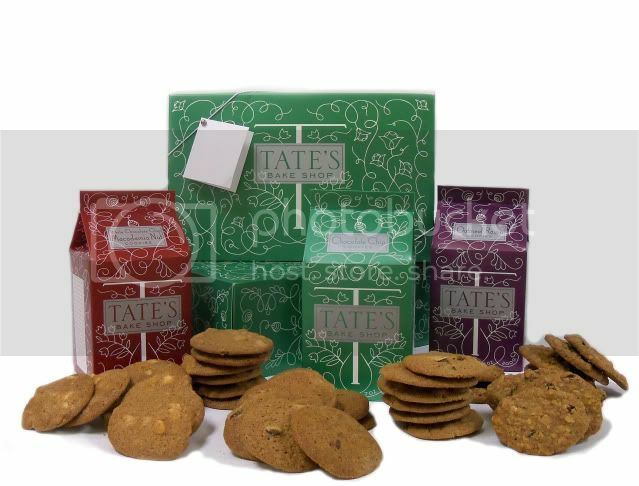 Tate's is a bakery based in Southampton that makes crisp, delicious cookies as well as cakes, brownies and squares. I generally consider myself more of a puffy, chewy chocolate chip cookie kind of girl, but I devoured half of the chocolate chip cookies within 20 minutes of their arrival. Oops. 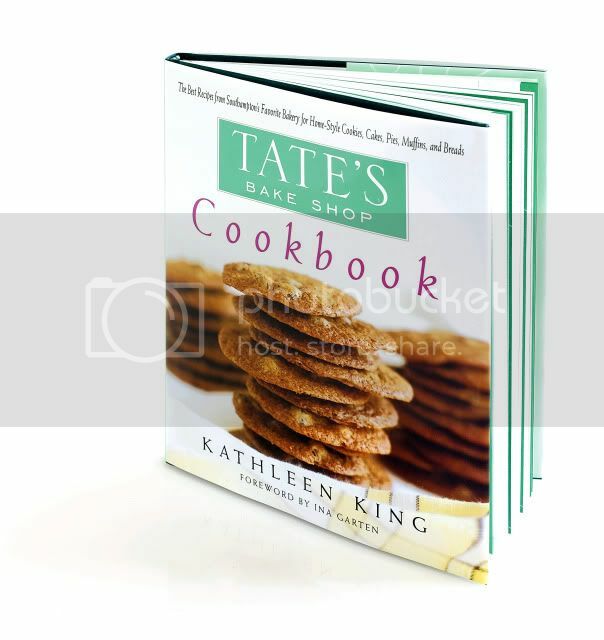 Luckily for you, since I have none left to share, you have the opportunity to win your own gift box of Tate's cookies and the Tate's cookbook to find your own baking inspiration. Just leave a comment here telling me what recipe you make as a holiday gift and you are automatically entered in the drawing. If you become a fan of Tate's on facebook, you get to enter twice. Just leave another comment letting me know you became a fan and that will serve as your second entry. Sorry to all you foreign readers, but for shipping reasons, the giveaway is only open to U.S. residents. Not a baker? Tate's doesn't want you to miss out either. You can still check everyone off your holiday list by ordering cookies online. Tate's will even give you 15 percent off your online order. Just enter the code 'cookie' anytime before December 31st and the discount will be automatically applied. I plan on making white chocolate chip cookies for some of my holiday gifts this year. I found such a yummy recipe. We will be making pecan toffee this year as part of our Christmas gift. I have become a fan of Tate's Bake Shop on Facebook. That's a fascinating fact about the Animal Crackers being the first commercially produced cookie in the U.S! I plan on trying out a new Gingerbread Man recipe to bake as gifts this year. I've become much more confident in my baking & cooking skills again recently, and I hope that I win this contest! Thanks. I always make jam thumbprints for the office and in-laws. Ok, now I want to make truffles - if I look back in your archives will I find the recipe you used? Cranberry shortbread bars - and this year I am going to make truffles as well! I make every year honey almonds to give away, but since i got a new job this year, i am not sure if i am going to have time..so this would come in handy for me to shane with loved ones!! thanks for an opportunity to WIN. I am planning on making caramel pieces to give to friends and family for the holidays. Thank you for being an inspiration to making fabulous meals! I've never actually baked for holiday gifts. I am the designated birthday cake baker among friends and family, but not during the holidays. But this year I have a list of holiday cookies and bars that I want to bake for friends, and the fam bam! Whether they want the extra calories or not! I totally agree about baking presents: fun, cheap, yummy, and you can listen to your favorite Christmas music while doing it ;-) I usually make shortbread because at no other time of the year will people knowingly eat something with that much butter in it.